No Pinoy fiesta is complete without this crispy fried goodness. 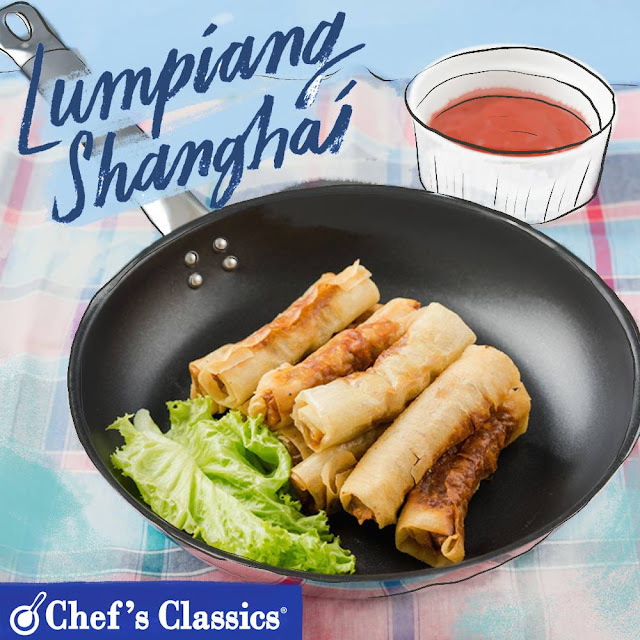 This week, we will learn how to cook Lumpiang Shanghai. 1. Combine all of the ground meat, carrots, salt, pepper, eggs, flour and white onion. Mix well. 2. Separate wrappers into individual sheets and lay wrapper in a square on a flat working surface. 3. Spoon about 1 tbsp of meat mixture and wrap using the lumpia wrapper. Gently tap each side with water to enclose the lumpia forming a log that is approximately 2 inches long. 4. Heat Chef's Classics Lavender Frypan and add in cooking oil. Make sure oil is hot enough but not smoking. Deep fry lumpia in batches to medium heat only. 5. Remove from the frypan and let the excess oil drip.